This is fusion cuisine, Brazil meets Africa, with a hint of Thailand thrown in for good measure.XimXim (Pronounced "zhing zhing) is an African dialect word meaning stew. 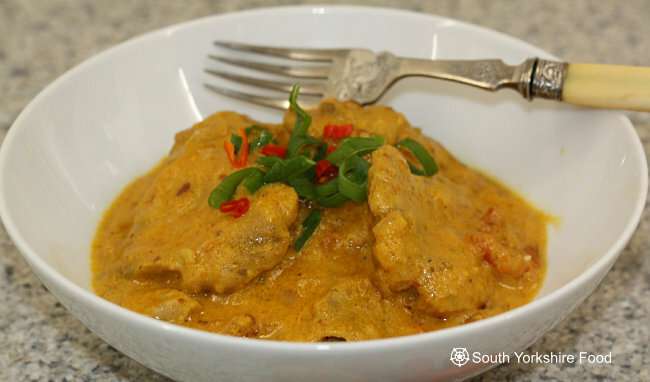 The exotic nutty and creamy flavours of Chicken XimXim make this a most delicious dish to serve for your friends, or just for yourself as a tasty supper dish. Place the chicken pieces in a medium bowl and add the garlic and lime juice. Massage the chicken, making sure the juice is well distributed. Cover the bowl with cling-film and allow the chicken to marinate at room temperature for 15 to 30 minutes while you prepare the other ingredients. Remove the chicken from the marinade and wipe off any remaining garlic. Lightly pat the chicken dry with a paper towel and season with salt and pepper on both sides. Add the 2 tbsp of groundnut oil in a large non-stick sauté pan, and cook the chicken pieces over medium heat, until they are lightly browned, about 3 minutes on each side. If necessary, do it in batches and as you remove the chicken pieces, place them in a medium sized casserole dish. Add the shallots and spring onions to the juices in the pan, stirring occasionally and scraping the brown bits off the bottom of the pan, until the onions are soft and tender, about 3 minutes. Add the chopped tomatoes, tomato paste, and ground nuts, and peanut butter and stir to blend well, about 1 minute. Add the coconut milk, chicken stock cubes, turmeric, any remaining lime juice and garlic from the marinade, the paprika, garlic, and honey, and let the sauce come to a simmer. Then add it to the casserole dish with the chicken. Place in the heated oven and cook for 1½ hours until the chicken is tender, and the sauce is thickened.